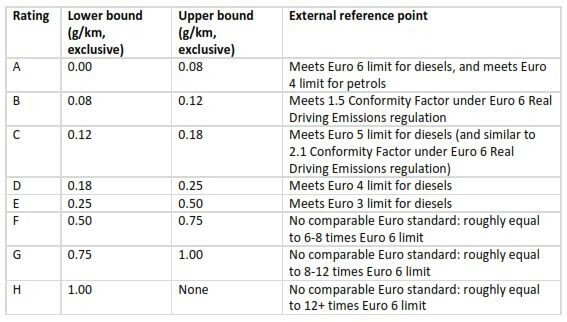 The table below shows the proportion of pre-RDE Euro 6 diesels from a range of manufacturer groups that meet various emissions levels, on our real-world scale. For example, 33% of all BMW/Mini Euro 6 diesel vehicles tested by Emissions Analytics achieve a rating of ‘A’. The final column of the table indicates the proportion that meet ‘A’ to ‘D’. This is relevant to the 270 mg/km maximum limit proposed in an agreement between the German government and cities, to be judged in real-world conditions. The ‘D’ rating is a near equivalent to this level. While the 270 mg/km limit is currently only proposed to apply to Euro 4 and 5 diesels, in time it could be extended to Euro 6 vehicles. If this were to happen, the table shows what proportion of these manufacturers' vehicles may be restricted from the 14 German cities cited. Therefore, VW, BMW and JLR would be the least affected of all. In addition, this is before the benefit of the fixes and retrofits that have been, or may be, actioned, which would further reduce the restrictions. In contrast, there are manufacturers that could face having all their Euro 6 diesels restricted. Nick Molden, Emissions Analytics' Founder and CEO on 15th October 2018. 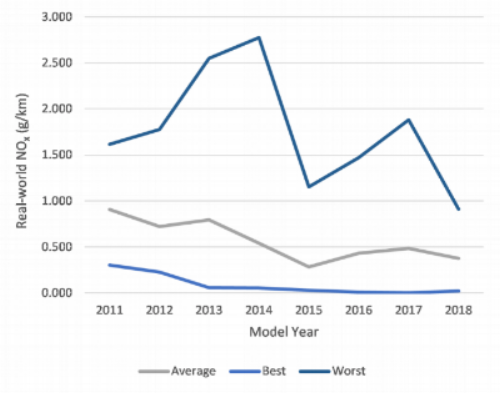 Much rides on the new Real Driving Emissions regulation working: the credibility of the auto industry and regulators, as well as consumer confidence in the internal combustion engine. This webinar seeks to demonstrate real-world emissions performance on the most recently certified passenger cars in Europe, and to examine what that reveals about the automakers approach to emissions reduction and compliance. Emissions under regeneration of the diesel particulate filter. We have now tested six of the latest RDE-compliant diesel vehicles, also known as 'Euro 6d-temp'. Their average NOx emissions were 48 mg/km, 40% below the regulated limit itself, and 71% below the effective limit once the Conformity Factor of 2.1 is taken into account. (As ever, it should be noted that while the EQUA Index test is broadly similar to an RDE test, it is not strictly compliant.) However, it should be noted that there are many cleaner diesels even before RDE, with 30 prior models achieving real-world emissions of 80 mg/km or less. The European Union Roadworthiness Directive came into force on 20 May 2018 and will play a role in enforcing type approval emissions limits, subtly but powerfully changing its role and previous focus on safety, to the benefit of air quality. In the new inspection and maintenance test, known for example as the MOT test in the UK, a ‘major’ defect and automatic fail arises from any visible smoke being emitted by any car equipped with a diesel particulate filter (DPF), meaning in practice the majority of vehicles since late 2009 (Euro 5 onwards). The definition of ‘visible smoke’ has only tightened up for vehicles registered after 1 January 2014, meaning late Euro 5 and all Euro 6. Permitted smoke for these cars has more than halved from 1.5m-1 to 0.7m-1. This measurement is familiar to any MOT tester and denotes opacity, where 0.0 m-1 is totally clear and 10.00 m-1 is totally black. In practice, less than 0.7m-1 is judged to be invisible and more than 0.7m-1 will be visible. For vehicles from 1 July 2008 to 31 December 2013, the standard is 1.5m-1, while the smoke standard for older cars remains unchanged, at 2.5m-1 (non-turbo) 3.0m-1 (turbo). Air quality campaigners have been quick to note the perversity of a tougher test that only applies to newer cars. However, it has long been politically unfeasible to apply new standards to old cars, which would see the wholesale removal of vehicles that met their type approval at the time of their manufacture. The revised smoke test for vehicles since 2014 is likely to catch out cars where the DPF is absent or defective. Particulate emissions rise by orders of magnitude when the DPF is missing or blocked. In the UK, 1800 cars have been caught without a DPF since 2014, but the true figure is believed to be much higher because it is notoriously difficult for testers to identify DPF removal in the small amount of time taken to perform the MOT. 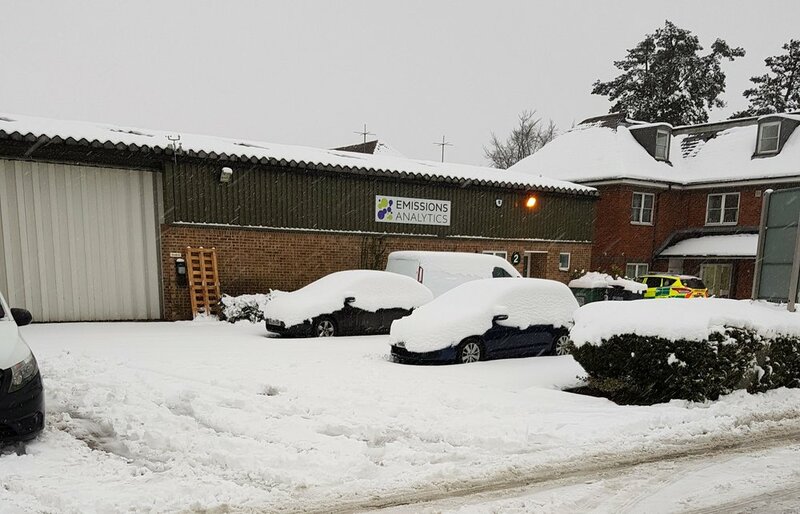 In an exercise Emissions Analytics conducted in 2017 with BBC 5 live Investigates, a car with its DPF removed still passed its MOT at three (out of three) different garages. Mechanics failed to spot the filter had been taken out on each occasion, and the car was not failed for opacity. To quantify the difference between having a DPF and not having a DPF, Emissions Analytics technicians tested a 9.0 litre commercial diesel engine before and after the installation of a DPF retrofit. The particle number (PN) and particle mass (PM) afterwards were close to zero, so the reduction was over 99%. Therefore, tampering would increase the emissions by orders of magnitude. As this problem of DPF removal detection has not been eliminated, it is believed that the tougher smoke test will most likely identify missing filters, although we think a greater degree of tester training and adherence to test processes is also required. A weakness of the new test is that is does virtually nothing to enforce emissions limits for nitrogen dioxide (NOx). Emissions control equipment is only subject to a visual check for its presence, including the oxygen sensor, NOx sensor and exhaust gas recirculation valve. Should any of these items be ‘missing, obviously modified or obviously defective’, the car fails the test. However, the new (UK) MOT Manual skimps over this area by suggesting in section 8.2.2.1 (Exhaust emission control equipment for diesel engines), telling testers, “You only need to check components that are visible and identifiable, such as diesel oxidation catalysts, diesel particulate filters, exhaust gas recirculation valves and selective catalytic reduction valves.” We suspect that in numerous cases this requirement will be neglected owing to the continued difficulty of determining the presence of some of these items, or because of commercial pressures to complete tests quickly. Almost all Euro 5 diesel cars had no NOx after-treatment, just exhaust gas recirculation (EGR), while their Euro 6 successors typically received the addition of either a Lean NOx Trap (LNT) or a Selective Catalytic Reduction (SCR) system. Therefore, as a rough equivalence, a Euro 6 car with failed after-treatment may emit at a level more akin to an equivalent Euro 5 vehicle. 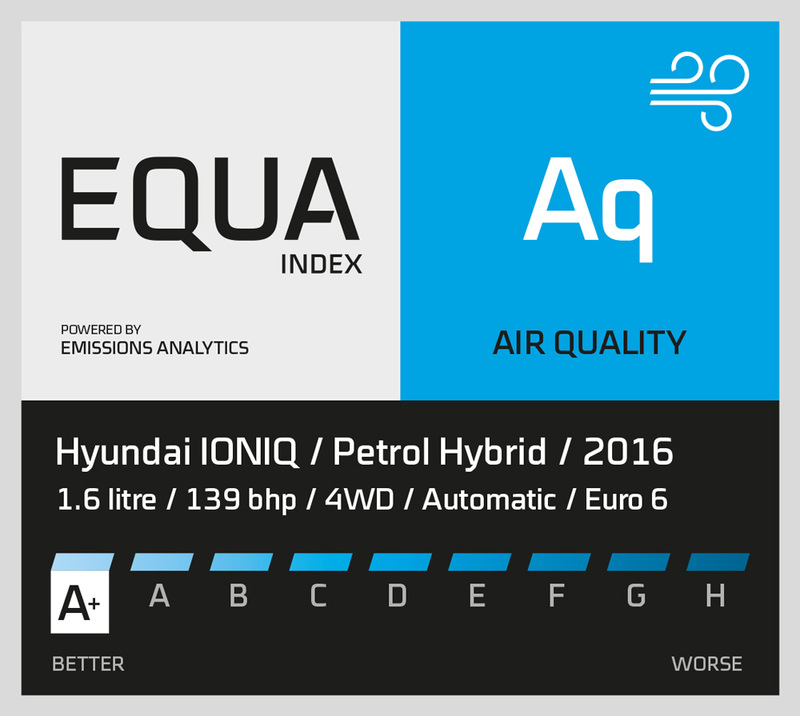 Emissions Analytics has tested numerous Euro 5 and 6 cars on its on-road EQUA Index (www.equaindex.com) route. For example, a Euro 5 VW Golf 1.6 litre diesel emitted 0.557 g/km of NOx, while its LNT-equipped Euro 6 successor emitted 0.161 g/km, a reduction of 71%. Then take the larger Mercedes C-Class 2.1 litre diesel. In Euro 5 guise it emitted 1.226 g/km of NOx; and with SCR fitted to the Euro 6 version the same engine emitted 0.396 g/km, a reduction of 68%. From these results it is clear that to disable these treatments (with an “emulator” or similar) or where they have malfunctioned, NOx could increase by a factor of over 3. However, the dilemma in setting an in-service NOx standard is that the performance of vehicles when brand new varies from around 20 mg/km to over 1500 mg/km – the issue uncovered as a result of the dieselgate scandal. A vehicle normally producing 20 mg/km that is malfunctioning might produce 800 mg/km, whereas a different model may produce 800 mg/km when in a fully functioning condition. 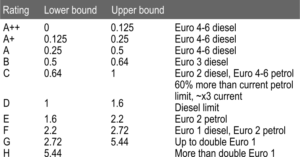 Therefore, a real-world reference number is required to judge the in-service performance. 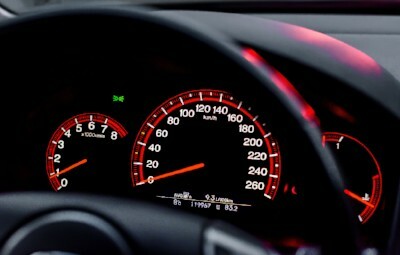 The EQUA Index rating, which is a standardised test on the vehicle when new, could act as this reference value to increase the accuracy of identifying malfunctioning vehicles. One unmistakable outcome is that what was once mainly a test for roadworthiness has now become a more complex enforcement of type approval emissions, at the very moment when those limits are tightening up within WLTP/RDE. The inspection and maintenance system has in this sense risen in importance as a tool for policing emissions, because non-compliant vehicles will display vastly increased emissions, by orders of magnitude. However, the failure to test properly for NOx misses one of the major problems that Europe faces, in the wake of its dieselisation, while the ultrafine particles produced by downsized, direct injection petrol engines are also missed. It feels as though the new test is distinctly lacking in these crucial areas, leaving much more work to be done. The reality of the 2008-9 scrappage schemes, however, was that governments in Europe, the US and Japan were tackling a liquidity gap by stimulating consumption and bolstering an ailing car industry. The mooted environmental benefits of accelerated fleet renewal were talked up by politicians but were not the main objective. This helps to explain why the efficiency of the schemes in mitigating Greenhouse Gas (GHG) emissions - CO2 dominating discussion at the time - was found to be poor value for the taxpayer and of marginal consequence to overall path reductions towards a low carbon economy. Pollution is a major contributor to chronic human sickness, not just environmental damage, according to the 2017 annual report of England’s Chief Medical Officer, Professor Dame Sally Davies, released on 2 March 2018: https://www.gov.uk/government/publications/chief-medical-officer-annual-report-2017-health-impacts-of-all-pollution-what-do-we-know. The report made 22 policy recommendations, many of which related to monitoring and ameliorating pollutant emissions. Emissions Analytics is pleased to have had its EQUA Index real-world emissions rating system (www.equaindex.com) cited in the report. With the failure of the previous EU vehicles emissions regulatory regime, having led to around 40 million high-NOx-emitting diesels on European roads, the need to base policy on real-world emissions has grown, as illustrated in the chart below. Each point represents a vehicle we have tested, and the horizontal line shows the regulated limits. It is clear that at each Euro stage the cleanest vehicles have been getting cleaner, while the dirtiest vehicles have not. Therefore, any system of discriminating between vehicles based only on Euro stage will be highly inefficient as it will involve permitting some vehicles with high real-world emissions. The particularly problematic Euro stages are 5 and 6, within which there are significant spreads from the best to the worst. For example, the dirtiest Euro 6 diesels are six to seven times higher emitting than the cleanest Euro 5. More striking still, the dirtiest Euro 6 diesels are around three times worse than the cleanest Euro 3/4 vehicles, last of which were type-approved in 2009. In summary, using the EQUA Indices would allow governments and cities to target only those vehicles which are high emitting in practice, minimising the private and public cost. Any system based only on official Euro standards would be costlier and less efficient. Estimates of the benefit suggest that 54% of Euro 6 diesels would have to be restricted from urban areas to achieve an 87% reduction in nitrogen oxide emissions. Many of the Chief Medical Officer’s recommendations revolve around the need for evidence-based action. This has been dramatically lacking in emissions policy, due to the difficult choices it would present. One recommendation specifically calls on local government and public health professionals to implement concrete solutions. The Mayor of London’s publishing of the EQUA Aq ratings for NOx on its official website (www.london.gov.uk/cleaner-vehicle-checker/) is an example of proven action that could be applied in any city across Europe. Another recommendation talks about providing toolkits to assist local authorities. With the challenges of Clean Air Zones, the priority is to link up the existing empirical evidence with policy action on the ground. An example of this is when regulating against particulate number emissions: current certification of particle number (PN) emissions is down to 23 nanometres in size. However, ambient pollution laws still focus on PM2.5, or 2500 nanometres in size. The concern about ultrafine particles has been growing, as the penetration of direct injection gasoline engines has increased. Latest test data from Emissions Analytics also suggests than certain diesels are now lower in CO2, carbon monoxide (CO) and PN emissions that many gasoline cars, and equivalent levels of NOx. This should be carefully borne in mind as policy increasingly slants away from all diesels. The Chief Medical Officer’s report also recommends a standardised approach to pollution surveillance and road charging to give vehicle drivers a simple and consistent system. While the new Real Driving Emissions (RDE) regulation is robust, it is not simple and consistent, which will limit its effect in rebuilding consumer trust. In particular, previously launched cars will not be systematically retested on RDE and therefore there will be no comparability with new cars. Finally, the current lack of trust in car manufacturers is not to the benefit of them, consumers, the market or society. A further recommendation calls for transparency on the part of industry as to the polluting effect of their activities. Emissions Analytics believes this is a necessary first step to rebuilding that trust. 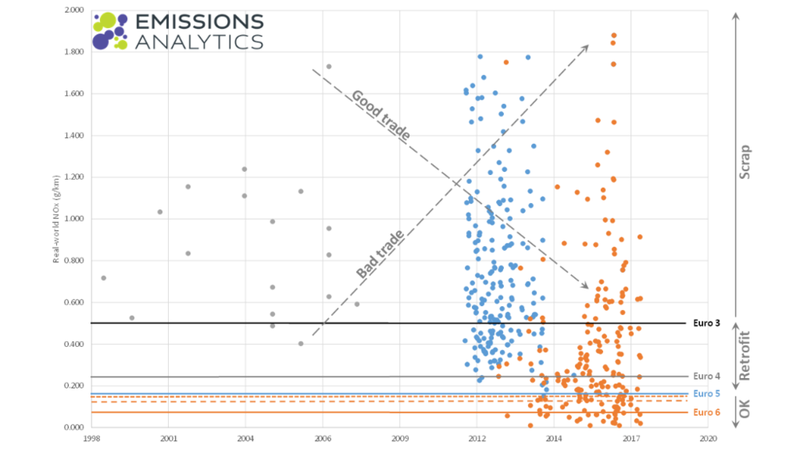 Emissions Analytics hopes the simple, independent and free-access nature of the EQUA Index is a good place to start to reassert evidence-based policy and the health of the automotive industry. 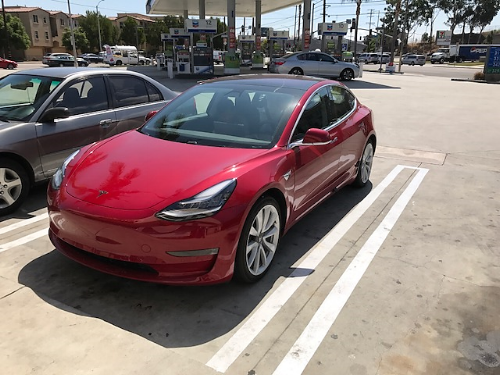 Electric vehicles now rated by EQUA Index – Tesla 3 result. 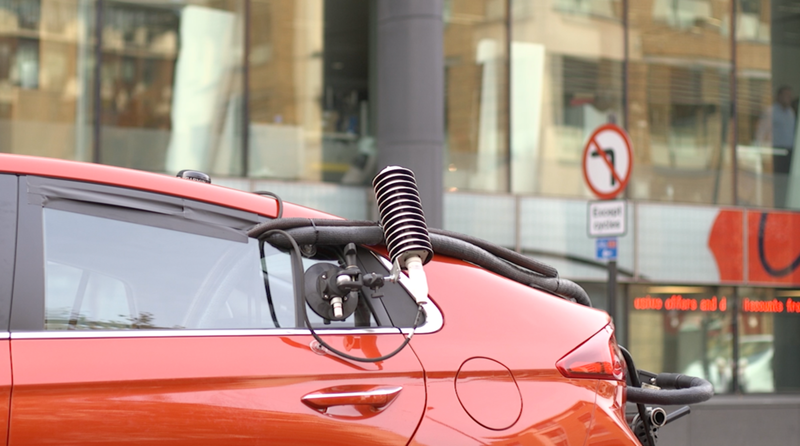 At the same time as these developments, behind the scenes, Emissions Analytics has initiated a process to formalise its methods and evolve it to be relevant for testing the latest vehicles, including European diesels under Real Driving Emissions and EVs. In November, the inaugural workshop of this "CEN" process was held in Brussels. CEN, or Comité Européen de Normalisation, is a framework for standardisation of products and techniques across the European Union. After a period of open scrutiny and discussion, the testing methodology could become an official voluntary standard, for any organisation to use. The link between these two recent events is that the ever-growing complexity of car choices needs an accurate, fair, trustworthy standard for measuring efficiency and emissions. Consumer trust must be rebuilt and cities need good tools to meet the air quality goals. There is also the issue of CO2 emissions to be considered. Despite Donald Trump tweeting that climate change was, “created by and for the Chinese in order to make U.S. manufacturing non-competitive,” the British government has an empirical view on global warming and stands by its commitment to cutting its carbon footprint. Would ministers give away the 16% CO2 advantage – according to Emissions Analytics’ testing – diesel has over gasoline for the same distance driven in real-world operation, until there is a viable alternative.